The Yale School of Music presents a Doctor of Musical Arts recital featuring pianist Ryo Yanagitani on Thursday, January 10, 2013. The gold medal medal winner of the prestigious San Antonio International Piano Competition in 2009, Yanagitani will play a program featuring music from the Baroque to today. The concert begins at 8 pm at Morse Recital Hall, located in Sprague Hall at 470 College Street, New Haven. Yanagitani will open the program with Handel‘s Keyboard Suite No. 3 in D minor, HWV 428, followed by Debussy‘s suite Pour le Piano. The first half closes with the evocative Butterflies and Bobcats by the contemporary Canadian composer David L. McIntyre. The recital concludes with Chopin‘s popular and virtuosic Ballades, a set of four pieces that earned Yanagitani a special prize in the San Antonio Competition. The Horowitz Piano Series at the Yale School of Music presents a recital by the Radu Lupu on Thursday, January 17. In this recital, Lupu will perform music by Franz Schubert, César Franck, and Claude Debussy. The concert opens with Franck’s Prelude, Chorale, and Fugue, a masterpiece of the piano repertoire whose three movements are thematically interconnected. Next will be Schubert’s Four Impromptus, Op. 142, which are often said to resemble a four-movement sonata. After intermission, Lupu will close the evening with Book Two of Debussy’s Préludes, written one hundred years ago in 1912–1913. The concert takes place in the excellent acoustic of Morse Recital Hall, which is located in Sprague Memorial Hall at 470 College Street. The event is part of the Horowitz Piano Series, which is directed by Boris Berman. The Yale School of Music presents a Doctor of Musical Arts recital featuring the music of Douglas Fisk on Thursday, December 20, 2012. The program, which features a variety of Fisk’s solo, vocal, and chamber works, begins at 8 pm at Morse Recital Hall, located in Sprague Hall (470 College Street, New Haven). The concert opens with Banjo and Shadows (2009), a cycle of cycle of five songs for baritone and piano using texts by the poet Carl Sandburg. Next is Impromptu for solo marimba (2007), which Fisk says was inspired by how Schubert’s impromptus “explore diverse musical textures while maintaining proportion and nuance of expression.” Refuge for string quartet closes the first half of the concert. Teachers participate in a break-out session at the 2011 Symposium on Music in Schools. The Yale School of Music is pleased to announce the fourth biennial Symposium on Music in Schools for June 6-9, 2013. 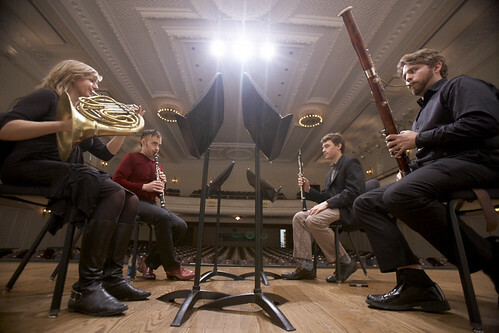 Supported by the Yale College Class of 1957, the Symposium is a program of the Music in Schools Initiative. This event honors fifty teachers from throughout the United States for their outstanding accomplishments teaching music in public schools. Teachers participate in a variety of discussions and workshops, and receive Yale Distinguished Music Educator Awards at the closing banquet. The nominations process closes on Friday, December 14. All current teachers of music in United States public schools are eligible for nomination. Teachers may be nominated by a school district representative (superintendent, principal, music/arts supervisor, etc.) or a member of the Yale College Class of 1957. Nominated teachers are invited to complete an application including a personal statement. Applications will be reviewed by a panel of music professionals, and fifty teachers will be chosen to attend the Symposium, all expenses paid. Award recipients will be notified by March 8, 2013. Teachers will stay in Yale housing and eat in Yale dining halls, as well as attend workshops in Yale classrooms and lecture halls. New Haven Public School music teachers and members of the Class of 1957 will also participate in the Symposium. The theme of the 2013 Symposium is “The Role of Music in School Reform.” Information on past Distinguished Music Educators can be found here. Students from the Yale School of Drama, Yale School of Music, and Yale College join forces in the School of Drama’s production of Sunday in the Park with George. Dan Schlosberg ’13MM has orchestrated the score and served as music director, and several additional School of Music students are performing in the orchestra. Sunday in the Park with George features music and lyrics by Stephen Sondheim and book by James Lapine. This production is directed by Ethan Heard. Performances take place December 14, 15, 17, 18, 19, and 20 at 8 pm at the University Theatre (222 York Street, New Haven). Tickets are available here. School of Music students and alumni playing in the orchestra are flutists Anouvong Liensavanh and Ginevra Petrucci; clarinetists Ashley Smith and Gleb Kanasevich; violinist Victor Fournelle-Blain; violist Colin Brookes; and percussionist Jonathan Allen. Students from the Yale School of Drama, Yale School of Music, and Yale College join forces to bring this Pulitzer Prize-winning musical to life. With lush, new orchestrations performed by a nine-piece orchestra, this production embodies the agony and ecstasy of making art. On December 5 the music world, and in particular American music, lost one of its great artists. Dave Brubeck‘s distinctive voice changed the landscape of jazz in this country and beyond. Dave Brubeck, front left, with Aldo Parisot and the Yale Cellos in 2004. The Yale School of Music will present the final Lunchtime Chamber Music concert of the semester on Wednesday, December 12. The concert begins at 12:30 pm at Morse Recital Hall in Sprague Hall (470 College St., New Haven). The program includes chamber music by Handel, Brahms, Schubert, Poulenc, Bartók, and more.